Bencini was an Italian camera manufacturer between 1937 and the late 1980s. The company was founded with the name ICAF in 1937, in Milano, Italy by Antonio Bencini. ICAF manufactured the Roby 120 6x9 camera, the Gabry 127 4x6 camera, and the Delta 120 6x9 folding camera. Shortly before WWII, the company name was changed to CMF. During this period, the company introduced the Etna and Argo cameras but soon ceased producing cameras in order to manufacture airplane components for the war. In 1946 the name became C.M.F. Bencini Later, in the early 1950s, the name was changed again to Bencini S.p.a.. 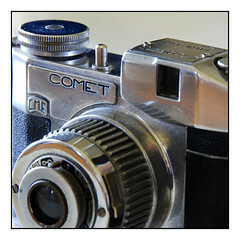 The company continued designing and manufacturing cameras until the late 1984 when business problems led to an announcement that distribution of the company's product line would be taken over by Cafer Ltd. Cafer released a few more Bencini-branded products until shortly before Antonio Bencini's death, and then retired the Bencini and Comet brand names. The Bencini name became associated with the company's characteristic rigid body cameras. But it made also folding cameras like the Argo rollfilm folder with Aplanatic F:10.5 lens in CMF A3 single-speed shutter. Bencini made cameras for other brands such as Boots and Trifca. This page was last edited on 8 January 2019, at 11:15.